It’s getting easier to get a car loan, which is good news all around. Easier car loans benefit subprime borrowers at a time when more Americans than ever have low credit scores. A looser car credit market helps the the auto industry sell more cars. Selling more cars to people with low credit scores is good for subprime auto lenders. And selling more cars is good for a U.S. economic recovery that is trying to gain momentum. Auto lenders are expanding as the car credit market shows signs of life. The Associated Press reports that car buyers with low credit scores are getting a break. Historically, the approval rate for subprime borrowers — those with scores below 620 — ran about 60 percent. Last year, the rate fell to 5 percent. Now, it’s running at 9 percent. Subprime borrowers still need to make a bigger down payment and will pay more interest, but car buyers with bad credit make up a big chunk of the market. About 17 percent of all the auto loans written for new car buyers in the first quarter of 2010 were to customers with subprime credit, the Associated Press article said. Subprime borrowers took out 53 percent of the loans for used cars, according to the credit reporting agency Experian. 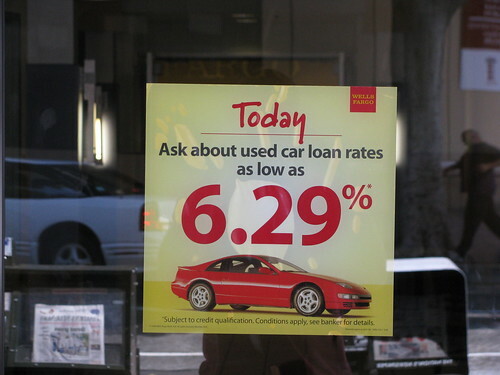 The increase in borrowing may be helped along by falling car loan interest rates. The average interest rate for a four-year car loan this month is 6.3 percent, down from 7.2 percent a year ago, according to Bankrate.com. Credit scores are falling to new lows for millions of Americans. Figures provided by FICO Inc. show that 25.5 percent of consumers — about 43 million people — now have a credit score of 599 or below. Subprime lending comes with higher default rates, which hurt the auto lending industry during the economic meltdown. But the Wall Street Journal reports that General Motors in particular is looking for ways to expand loans to riskier buyers. GM needs to reach buyers with weaker credit scores because they make up a larger portion of its customers than some of its competitors. To make more loans to people with low credit scores, GM made a deal with subprime auto lender AmeriCredit Corp. Under this arrangement GM augments the loans with cash incentives so it can offer more competitive rates. Americredit Corp. is One of the largest subprime auto lenders. The company expanded the number of auto dealers it works with to more than 8,000 in the first quarter of this year, up from 4,500 a year ago. Loans more eye-catching and appropriate. This is because Aussies consider things such as spending funds, way of life, financial uncertainty, and modifying rates, before going for a financial mortgage. With set mortgage, people know how much they have to pay each month and can plan their funds accordingly.